WASHINGTON (AP) Washington Wizards forward Markieff Morris studied video with coach Scott Brooks before Friday night’s game in an effort to end a slump. The extra work paid off with his best offensive performance of the season. 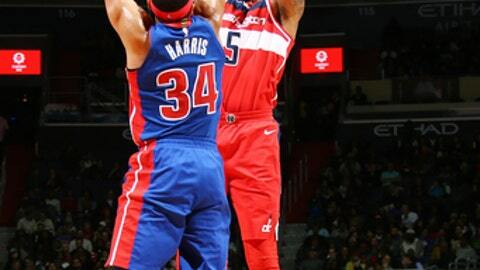 Morris scored 23 points, Tomas Satoransky added a career-high 17 off the bench, and the Wizards beat the Detroit Pistons 109-91 for their first home win in nearly three weeks. Otto Porter Jr. added 17 points, and Marcin Gortat had 12 points and 12 rebounds for Washington. The Wizards snapped a two-game home losing skid after they outscored Detroit 35-15 in the third quarter, the Pistons’ lowest scoring period of the season. Washington also improved to 3-3 this season without All-Star point guard John Wall, who has missed four straight games after getting injections in his left knee to treat swelling. Andre Drummond had 14 points, 17 rebounds and seven assists for Detroit, which was still outrebounded 49-32. Tobias Harris led with 15 points for the Pistons, who had their three-game winning streak snapped. Morris had just 18 points in his last three games, which prompted the video session with Brooks. ”Basically, he told me my activity was low, standing around the 3-point line too much,” Morris said. He responded with by shooting 10 of 16 from the floor and 2 of 3 from beyond the arc. He scored 14 of his points in the second half, which Washington began on a 17-0 run to open a 63-52 lead. The Pistons missed six field goals and turned it over four times during that stretch. They didn’t get closer than eight points the rest of the way. Wizards guard Bradley Beal began the game wearing protective goggles after taking an elbow to the face in Washington’s loss at Philadelphia on Wednesday, but he got rid of them by the second quarter. He scored 10 points. Despite posting impressive numbers himself, Drummond suggested his team was unprepared for the Wizards’ rebounding approach. Satoransky is getting more minutes with Wall out and scored 11 of his 17 points in the fourth quarter. He finished 5 of 6 from the floor and 5 of 5 from the foul line, leading a bench that outscored Detroit’s 41-32. The Pistons registered 20 assists, matching or surpassing 20 for the 15th consecutive game. … Drummond received a technical foul in the third quarter. … Drummond has 15 double-doubles in Detroit’s 21 games. … The Wizards announced that their NBA G League team will be named Capital City Go-Go, a reference to a style of music native to the city. The team will play at the Wizards’ new, yet-to-be-opened practice facility starting next season. … Gortat’s double-double was his seventh of the season. Pistons: Visit Philadelphia Saturday in the second of four straight road games. Wizards: Begin a five-game trip at Utah on Monday.